With CBTC, moving blocks introduce to the concept of contiguous track, because the railway is represented as a single contiguous block, rather than a set of adjacent blocks. This means that the safe separation behind the preceding train is dynamically calculated based on the maximum operating speeds, braking curves and locations of the trains on the alignment. Also, in this way the capacity of the railway is extremely increased. To get an introduction to CBTC system description, you are firstly invited to have a look to the concept of fixed and moving blocks. Moving blocks introduce to the concept of contiguous track, because the railway is represented as a single contiguous block, rather than a set of adjacent blocks. This means that the safe separation behind the preceding train is dynamically calculated based on the maximum operating speeds, braking curves and locations of the trains on the alignment. Also, in this way the capacity of the railway is extremely increased. While ERTMS is nowadays the European Standard technology for mainline railway signalling system, the most modern urban lines (e.g. London Underground, New York subway, Paris Metro) are equipped with the less standardised, but even more efficient, CBTC system. The CBTC (Communication Based Train Control) system is fully automatic (the driver is not required to run the train in normal operations), therefore it can be considered an ATO (Automatic Train Operation) signalling system. A simplified indroduction to CBTC system description follows. 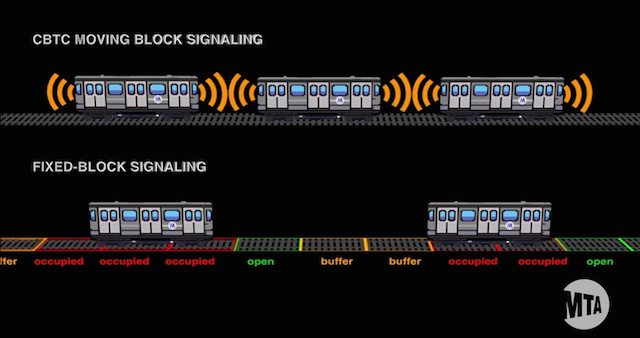 It ensures safe train separation and safe train movement throughout the system (comparing CBTC with ERTMS, this is the equivalent of what an RBC system does), plus it implements interlocking functions too with the purpose of process the route lock requests coming from the ATS subsystem. It provides regulation of train speed within the limits imposed by the Wayside Equipment, plus it provides information to the train driver via an on-board HMI. This PDF is a bit out of date (February 2011) but still useful to get more details about the system, its main suppliers, the most important project going on around the world and the main differences among the various CBTC solutions.